August 9, 2011 May 31, 2012 Nefer Khepri, Ph. D.
I know it’s been a while since I’ve posted anything other than a review. Things have been crazy this summer & I’m very thankful for that. This time last year I was in a full-scale panic. My business (Magickal-Musings.com) had not generated more than $150 in income during the month of July, 2010. My husband had been unemployed earlier in the spring and into early summer for 7 weeks and we were struggling to catch up with necessary bills. Due to his job loss, my near lack of an income for July (and not much more came in during the month of June), last year my husband gave me an ultimatum. On a THURSDAY he told me if I didn’t bring in $500 by MONDAY that he would consider my business defunct & have me shut it down & hit the pavement on Monday to look for a new job. All this occurred last August. I sent out a plea to all of my contacts asking them if they had been thinking of ordering anything from my site, to please do so ASAP since I was in immediate danger of losing my business. The response I received was immediate and it was also very touching. One client, Henri, sent me $11 saying the numerology of his donation would help me to manifest more. He didn’t order anything. Another client ordered a $150 Tarot Annual Forecast. She told me to get it to her “whenever” as she knew I had a lot on my mind. Many who could not afford to order at the time sent me encouraging emails, most of whom begged me not to close my business and said I was the only one they trusted for enchantments and readings. Many of those people went on to say how much I had helped them and some people have been clients for a decade. I received 114 supportive and loving emails, some from clients I hadn’t heard from in years. Along with those emails orders began to trickle in. A $45 reading here, a $50 enchantment there. I was amazed that after sending the mass email out on Thursday evening that by Saturday I had received orders totaling nearly $400. I was only a mere $100 from my Monday goal of $500. By that Monday, not only had my clients come through for me, but they did so with flying colors. My business generated just over $700 in a mere 4 days. It is due to my clients that Magickal-Musings.com is still here and I am still able to do the work that I love so much, which is helping others and being of service in a spiritual manner. I sent out another mass email thanking everyone for their support and informing them that my business was safe. In fact, after removing the names, I allowed my husband to read some of those supportive emails. You see, I’m like a Catholic priest or a lawyer. I believe in client/practitioner confidentiality. I do not share ANY details of any case with my husband, daughter, or anyone else. People come to me with very sensitive issues and I have enough respect for my clients to keep all the information to myself. So my husband was really clueless as to exactly what I did or how readings or spells could be of any help to anyone. Once he began to read those emails he got tears in his eyes. He kept saying, “I had no idea!” He then told me that I was providing a highly valuable service and that if anything ever got that bad for us again he assured me that I would be able to keep working and to maintain my business. So I never have to worry again. Now, flash forward to now, August, 2011, just 1 year after I nearly lost my business. Summers are notoriously slow for me. People go on vacation, the kids are home wanting to be taken to the movies and the mall. Come August it’s time to shop for school clothes and supplies. During the summer people just don’t have the disposable income they have during other times of the year. A business like mine, you see, depends upon “disposable” income, which is that part of your income you do not have immediate need for in terms of getting bills paid, keeping a roof over your head, or food in your tummy. When people have a few extra bucks, that’s when they order from a site like mine. So, as June approached I figured oh dear, here we go again, but I’ll have plenty of time to have fun with my 12 year old daughter, plus I knew for my June birthday my wonderful husband was taking me to Maui, Hawaii for a second time (we first went in 2009). While in Maui many wonderful things occurred. I fulfilled my life-long dream of snorkeling with sea turtles, whom I dearly love. As an added bonus on that snorkeling trip I got splashed in the face by a dolphin – who did so on purpose and it thought its antics were hilarious while the splash left another lady on the boat and I screaming. Another dolphin popped its head up at us and also laughed. It was awesome. Probably one of the best memories I’ll ever have. I was blessed with the addition of a new spirit guide while on Maui and I received a very strong emotional healing from Nature Herself while there. However, also while in Maui I had to keep my iPhone handy constantly. I began receiving a lot of inquiry emails from prospective clients who had found my site somehow. Then the orders began to come in. By the time we returned home a week later I was booked solid for the coming week! I have never in my 12 years of being online have been booked solid a week in advance. The amazing thing was that the orders – many from new people – just kept coming in. So by the end of that first very hectic week back at work the end of June I was booked solid for another week. I even had to break my cardinal rule of reserving weekends for family. I worked the entire 4th of July 3-day weekend just so I could keep up with demand! The pace has continued and so that is where I have been. I am “here” as being online, but I’ve been performing enchantments, doing readings, creating a Manifestation Mandala (which is nearly completed, see the photo at left), plus in between all that taking care of our house, our child, making meals, washing dishes, doing laundry, vacuuming, buying the groceries, and doing all the other “mom” things that I do on a regular basis. 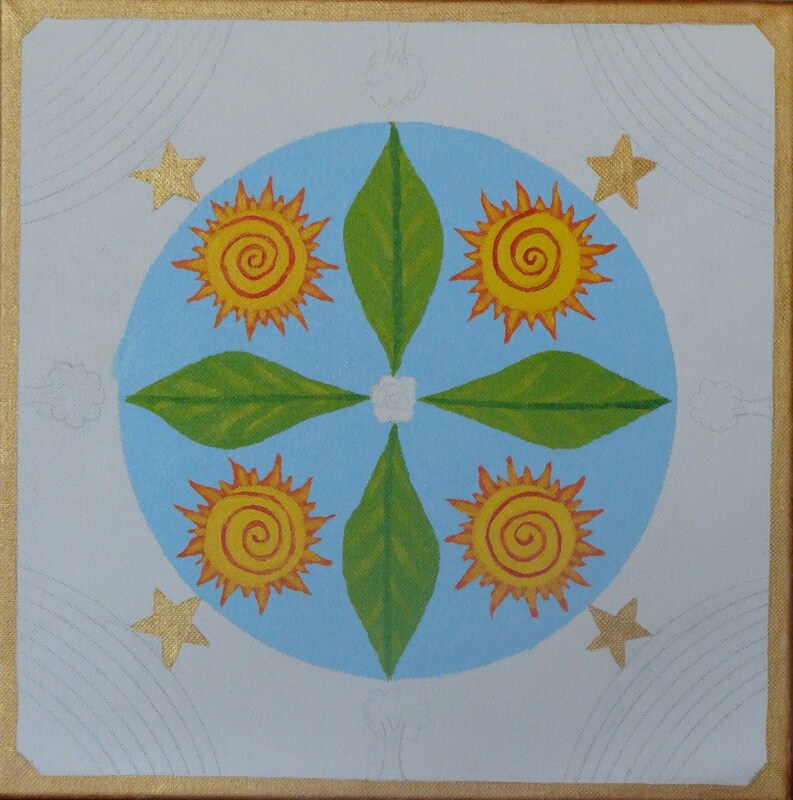 I didn’t even have time to focus on my own art work – my Magickal Musings Tarot has languished for most of the summer. I only returned to working on it in earnest this past weekend and a new card, the Ace of Birds, is now nearly complete. I am incredibly grateful for the huge growth spurt my business has experienced during a time that has been historically very slow. I don’t know what’s going on. Many tell me they find my site through a google search. If you google “how to contact spirit guides” or “contact spirit guides,” my page on how to contact your spirit guides comes up as Number ONE. I had no idea!! How it happened, again, I have no idea. Also, creating a presence for myself on Facebook has been a HUGE help. I have my regular profile page, a business page, and my groups: Living in the NOW: Gratitude & Appreciation Society (the newest group), Magickal Musings (the oldest group), Magickal Musings Tarot, and Manifestation Mandalas. Through my profile page, business page and groups I have “met” online many interesting and wonderful people. The Living in the NOW group is very special and dear to my heart. It’s barely a month old and we already have 76 members. The goal is to find three things about which you can express gratitude every single day. The idea being that the more we express gratitude to the Universe the more wonderful blessings we shall receive. Due to all my business-related activity on Facebook this has also brought me new clients, plus it helps to keep me in the eye of regular clients who can keep up with what’s going on with me through my posts and by joining my groups and liking my business page. This has been a totally insane summer. I’ve had to work every single weekend in July just to keep up with demand, but it’s been a wonderful feeling. I’ve helped many people over the years on every continent (except Antartica) and I am so very, very thankful that I am able to continue to fulfill my Soul’s Purpose in this lifetime, which is to act as a spiritual bridge for others and to also empower them to learn more about spirituality so that eventually they shall have enough information that they will be able to do such things on their own. Despite being so incredibly busy that I often don’t know whether I’m coming or going, I’m incredibly grateful for the faith and trust that total strangers place in me and I endeavor always to do my very best in filling every single order and I also make myself available in email to all my clients. All these years it’s been a real pleasure to get to know many of you and I look forward to many years of service to come. I wish you all a very blessed week. I’ll post again in a few days as I have a book review almost ready.